Energy Panel Structures, (EPS), received two Building Excellence Awards from the Structural Insulated Panel Association (SIPA). Each year, the Building Excellence Awards recognize the most energy efficient, sustainable, and unique buildings constructed with structural insulated panels (SIPs). The competition allows SIPA members to showcase their best work while demonstrating the design flexibility and energy efficiency possible with SIP construction. 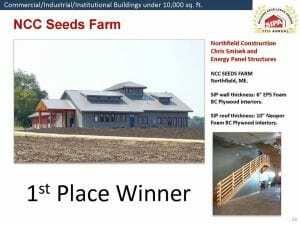 Northfield Construction Company was recognized by Energy Panel Structures, Inc – EPS for their energy efficient efforts on the Seeds Farm project and were awarded 1st place in the Commercial/Industrial/Institutional Buildings under 10,000 sq. ft division! The Seeds Farm project was a complex build using 6-inch EPS SIP wall panels and 10-inch EPS SIP panels with Neopor® foam for increased R-Value. EPS is headquartered in Graettinger, Iowa and is known for a diverse market of products including structural insulated panel systems, residential, agricultural, commercial and cold storage buildings.